Alright, alright. I know, I know. It’s been a (very) long time since I last posted anything to the site. Too long, in fact. There are a lot of good reasons for this, but I’ll have to save that for another day or post. Right now I’ve got to fill you in on what’s been going down the last few days! On Thursday of last week, the Pennsylvania Fish and Boat Commission conducted their fall stocking on Clark Creek in Dauphin County, PA. I’ve never witnessed a stocking before, so I decided to volunteer and see what it was all about. After all, I spent so much time fishing Clark this year, I figured it was the least I could do to give back. Man, am I glad I did. At first, I was a little apprehensive, if not downright nervous. After all, I was going alone for the first time and didn’t know anyone there. (Garrick was working.) That apprehension quickly vanished because the next thing I knew, I was throwing my waders on and climbing in the back of some guy’s pickup truck to head down to the creek with the fish commission truck hot on our heels. The newest edition to the Black Gnats – Gavin Craig. A pair of browns chase each other, breaking the surface. After the remaining volunteers finished chatting, Gavin and I spent the next few hours hanging out, trading fish stories, fly tying techniques and hearing the equivalent of “Cliff’s Notes” to each others background. We made plans to meet up on Monday of this week and hit the holes we had so eagerly stuffed with fish. Fast forward to Monday afternoon and I’m pulling into the parking lot along Clark’s Valley Road, about halfway through the fly fishing only section. 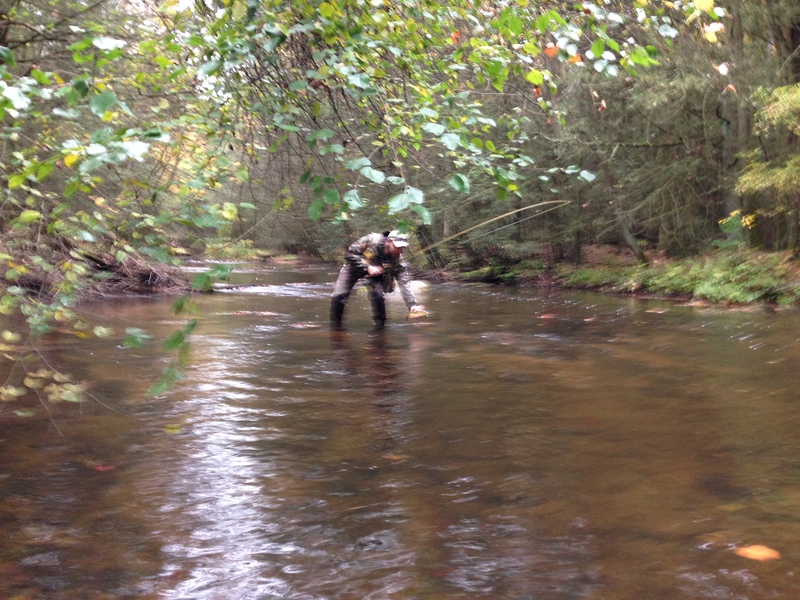 We throw our waders on, grab our fly rods and head down to the stream. The plan is to start downstream and work our way up, fishing until dark or until we’re sick of catching fish, which ever comes first. 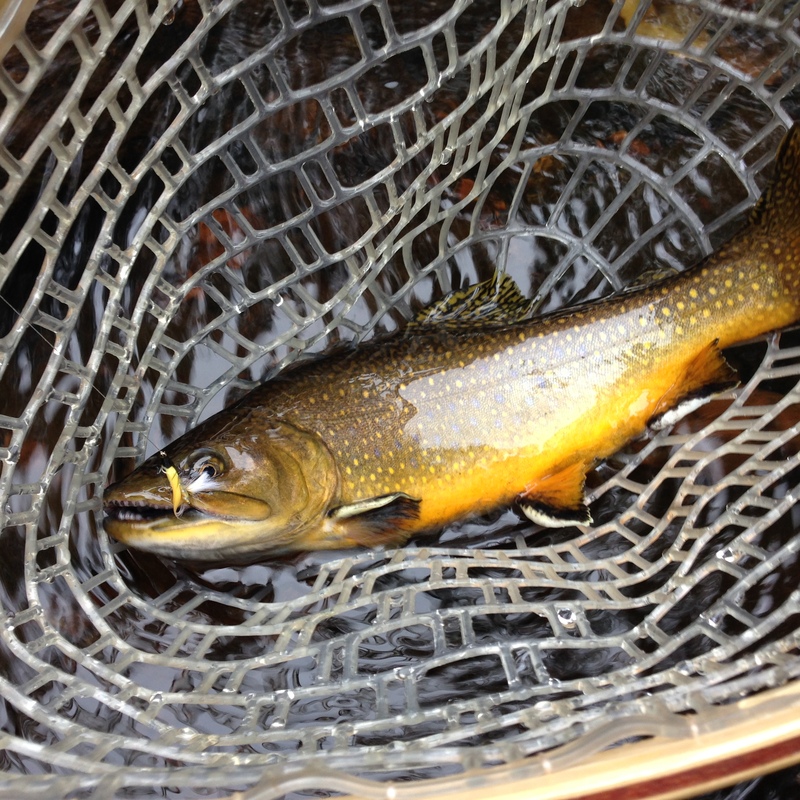 Andy’s first brook trout of the night, caught on a CB Stocker he tied a few days before. Gavin quickly evens the score. We make plans to slay fish … AGAIN! The next morning, as I’m walking out the door, I get an unexpected call from Garrick … “Hey man … so, if I wanna fish Clark’s right now, where do I want to be?” My jaw hits the floor in disbelief. “Hang on, I’m on my way.” Before you know it I’m introducing Garrick to Gavin and all three of us are hitting the creek on a sunny, beautiful Tuesday morning in mid-October. It feels like we’re playing hookie and I love it. At this point, I could make this post even longer and go into to detail about how our day went … or you could just watch the video at the top of the post for the highlights. In short, the morning felt like a blur of fish and hooksets. Needless to say, it was some of the best fishing I’d had in weeks, if not months. Do you have a similar story or pics to share? Any plans to hit some local water? Have you helped with a stocking or local conservation effort? Let’s hear it in the comments.